This craft project is a kid version of the grown-up Dangler Cards tutorial. Like in the adult version, this is a 3-dimensional, freestanding card with a dangler. It's made a bit differently for ease of construction and is designed for construction paper. 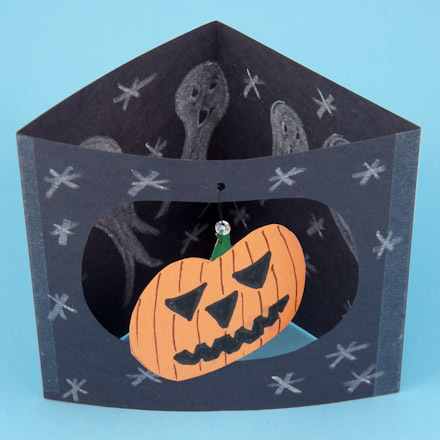 In this project, kids make a house spook from black construction paper with an opening to peer inside at the ghostly residents. 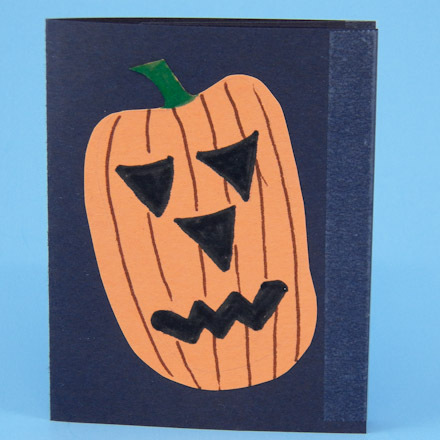 They will cut a jack-o'-lantern from orange construction paper to hang in the card's opening as a dangler. The front of the card is also decorated with a jack-o'-lantern cutout. This project is great for family, classroom or group craft time. It requires no patterns and uses basic craft materials. The craft can be done in one or two sessions, depending on the time available. 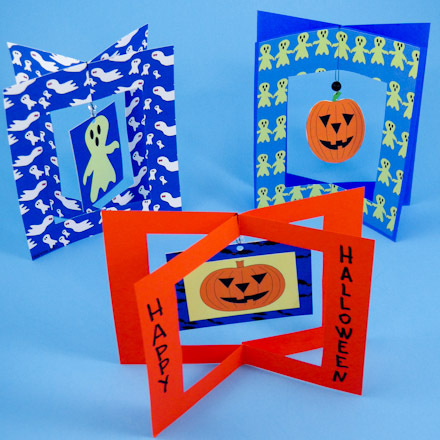 Related craft: See the projects listed in Greeting Cards Kids Can Make for more card making ideas just for kids! Black and orange construction paper, 9" by 12"
Pre-cut the paper. Cut the 9" by 12" black construction paper in half lengthwise to make two 12" by 4½" halves. Cut the 9" by 12" orange construction paper in quarters that are 4½" by 6". Each card requires one of the 12" by 4½" black papers and two of the 4½" by 6" orange papers. Cut the 12" by 4½" black paper into two pieces that are 7" and 5" long. Fold both pieces in half—match the short ends and then make a sharp crease with your thumbs. Tip: The card will fit in a standard invitation envelope or a #6¾ envelope. See Aunt Annie's Envelopes to Make project for printable envelope patterns—the Invitation envelope pattern fits the Spook House card. Cut a circle or oval opening in the smaller black paper. With the paper folded, draw half of a circle or oval on the fold—make it about 3" tall. Cut on the line and unfold your paper to check the size of the opening. Make any adjustments needed. Tips: Think about the shape and size of your jack-o'-lantern dangler when making the opening. 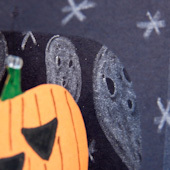 Unfold the 7" black paper and draw ghosts on the inside with a white crayon or white chalk. Add any other spooky drawings that you like. You could also add some glitter. On the front of the 5" piece of black paper draw stars with the white crayon or chalk. Tip: If you use chalk, lightly spray the paper with a sealant or hair spray to keep the chalk from smearing. 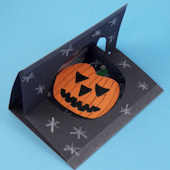 Cut out two jack-o'-lanterns from the orange paper—one for the front of the card and another to use as a dangler. Use the markers to color the pumpkins and turn them into jack-o'-lanterns! For the front, fold one of the 4½" by 6" orange papers in half lengthwise. Draw half of a tall pumpkin with stem along the fold and cut out. Add a scary face with markers and color the stem green or brown. Fold the 7" black paper in half with the ghosts on the inside and then glue the tall jack-o'-lantern on the front of the card. For the dangler, fold the other 4½" by 6" orange paper in half the other direction. 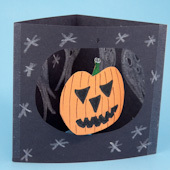 Trace the opening cut in the black paper along the fold and then draw a smaller pumpkin shape, with stem, inside it. Be sure there's about a ½" margin around the top, side and bottom of the pumpkin. Cut out the pumpkin and then color jack-o'-lantern eyes, nose and mouth on the cutout. Color the stem and add thin brown vertical lines to the pumpkin so it looks more pumpkin-like. Make the same markings on the other side of the cutout. Tip: If you hold the cutout face-down against a sunny window, you can trace the markings. Tape the two black pieces of paper together along their sides. Lay the 7" paper face down and the 5" piece face up. Align the short edges of the two papers and join with a piece of tape running along the seam. Trim any excess tape. Fold the card on the taped seam and match the other ends. Tape the ends together with another length of tape and trim any excess. Stand up your card. Cut a 10" length of string or thread for hanging the dangler. 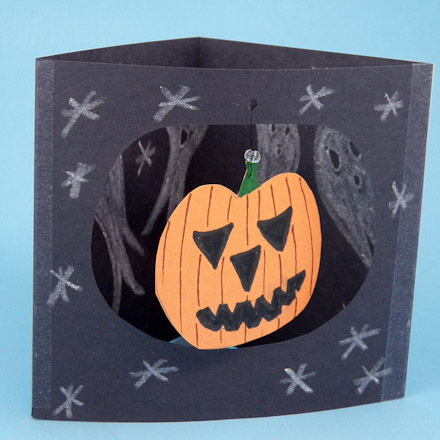 Punch a hole in the jack-o'-lantern's stem and push the string through the punched hole. Bring the two ends of the string together and thread through the hole in the bead. Tie a double knot close to the top of the bead. Punch a hole in the card, centered above the opening. Thread one end of the dangler's string through the hole, adjust the length of the string so the dangler hangs freely in the opening. Tie the ends together in a secure knot. Trim any loose ends, if needed. That's it! Your Halloween Spook House Dangler card is done! Tip: Draw ghosts and stars on the black paper using white crayons. You can also use white chalk, but be sure to seal it with a light spray of sealant or hair spray. Tip: Draw the ghosts so they appear to be looking out of the card's opening. Tip: The Halloween Spook House Card folds closed with the dangler inside. 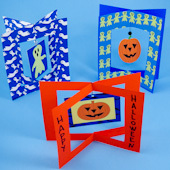 Tip: For more Halloween cards with danglers, see the Halloween Dangler Cards craft.